Learn about the equation of a line. 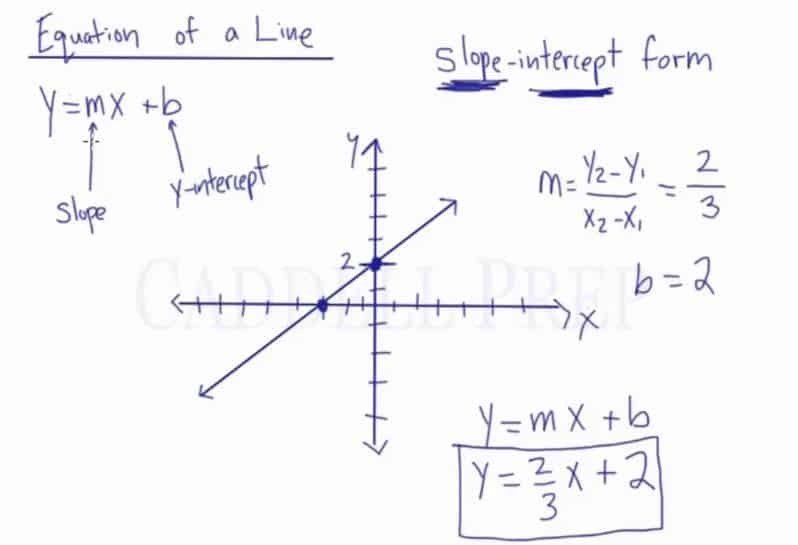 In this lesson, we’ll review the equation of a line and go over the slope-intercept form which is the most common equation of a line. It’s called slope-intercept form for a very specific reason. When we look at the equation, we will know what our slope is and its intercept. Intercept is where a line segment intersects the axis. The -intercept is the point where the line segment crosses or touches the -axis. Let’s look at the graph. Then count the change in and from the origin with coordinates. Now, let’s refer back to the graph and look where the line intersects the -axis. Meaning, find the point where the line meets the – axis and where the -axis is . Now, our -interecept is . Now, we’re ready to write the slope-intercept form.